Today: Fun Day Expo presented by Bundaberg Child and Family Centre at the Bundaberg PCYC from 9am to noon. Free for families to attend, fun activities including Old Macdonald's Farm. Phone Dawn Murdoch for more information on 4153 1614. Today and tomorrow: The Bundaberg Christian College Sew What's Crafty Expo, Bundaberg Civic Centre and Parish Hall. The expo will include craft workshops and demonstrations, scrapbooking and sewing competitions and displays and competitions. Food and drink available. Open 4-8pm today and 9am-4pm tomorrow. Entry cost: adults $5, school students $2.50, pensioners $4 and free for under school age. For more information, phone Sandra Lynch on 0466 680 933. Tomorrow: Bundaberg Symphony Orchestra Gala Concert, Shalom Performing Arts Complex, 7.30pm. Guest soloist is Bundaberg local Andrew Lorenze. Phone 4152 9750 for further information. 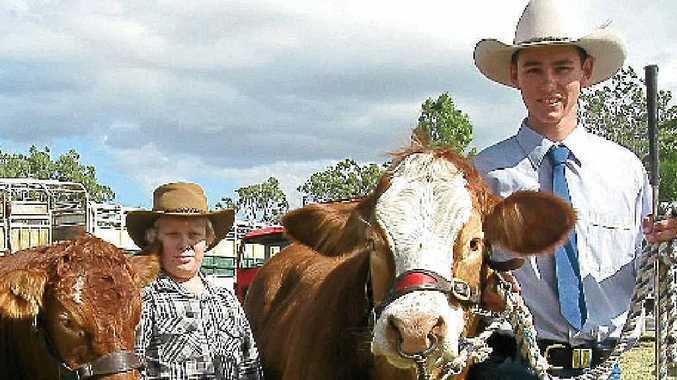 Tomorrow and Sunday: Biggenden Show, Biggenden showgrounds. Opening at 9am. Tickets to the show are $12.50 for a single or $25 for a family. School-aged children are free. For more information, phone Amanda Ormond on 4127 1553 or 0457 272 848. Tomorrow and Sunday: Mt Perry Campdraft, Mt Perry Showgrounds. Action-packed fun, food and licensed bar, live entertainment until late. Bring your chairs. Camping and hot showers free on Saturday and Sunday nights, breakfast available on Sunday. For more information, phone G. Wallace on 4156 3282 or 0427 563 282. Sunday: City to Coast Community Bike Ride. A leisurely 20km taking in the Bundaberg region, designed for everybody. Fully supported with police and route marshals, and bike mechanic support. Free sausage sizzle at the finish at Southhead Parkland. For more information, phone 4152 5241 or visit madcycologists.org.au. Sunday: Extreme Sunday family fun day, organised by the Heritage Christian Centre, Alexandra Park, Quay St. From 10-2pm. Food, live entertainment and amusements including rock climbing and jumping castle. Free. For more information, phone 4153 1649. Monday to Sunday: Bundy's 5th Aussie Country Muster, AgroTrend Grounds, Kendalls Road. A wide range of traditional Australian country music, ballads and bush poetry. Local entertainers, walk-ups, old-time dancing on Wednesday evening. Gates open 8.30am Monday, camping available. For more information, phone Rod 4152 4349 or 0400 524 343. Sunday Bundaberg Region Emerging Talent Showcase (BRETS) is hosting a community concert to showcase the talent of young people aged five to 18. The concert is a display of visual arts and performing arts. From 1.30pm at the RSL Hall, Milden St, Gin Gin. For more information, phone 4156 3122. Sunday RSPCA Million Paws Walk. Meet on the lawn of the Woodgate Beach Hotel from 9.30am; the walk kicks off at 10am sharp. Prizes for best-dressed pooch, happiest tail, the best trick and lots of other fun stuff. Wildlife carers and Dr Nicole from Childers Vet Clinic will be there to offer advice. Sausage sizzle at the end. For more information, phone Barry or Cate on 0404 195 699.